Each year on Mid-Autumn Festival (or Moon Festival) Chinese gather with family and friends to go outside and enjoy the full moon. As the holiday approaches, mooncakes appear in every store. Mooncakes are about the size of a hockey puck, just as dense and taste like I imagine a puck would taste. If you're lucky, you'll dig into one that tastes like a fig newton. If you're unlucky, you could be digging into eggs yolk, meat, or red bean paste. Part of the Mid-Autumn Day tradition is to exchange mooncakes with your friends, coworkers, students, and anyone else you know. The more expensive mooncakes you offer, the more face you receive. This year, we decided to join in the exchange, or "mooncake game". We really didn't know which mooncakes to buy so we purchased ones labeled "for an important person" and gave them away any chance we got. M'Lynn would keep some mooncakes in her purse and pull one out each time we say someone we knew. A week before the holiday, we gave one to Kanyon to eat as a snack. Cherry, our Chinese friend, said, "It's too early to eat mooncakes." I slowly hid the bag containing all the mooncakes we had planned to give her. I guess we'll have to wait a bit longer to give Cherry her mooncakes. It was fun to join in the exchange and it really is a exchange. Often mooncakes we received, we gave away to other friends. I really don't think mooncakes are meant to be eaten, unless we can get some of the most popular and expensive Haagen-Dazs' ice cream mooncakes. Now I would eat one of those. 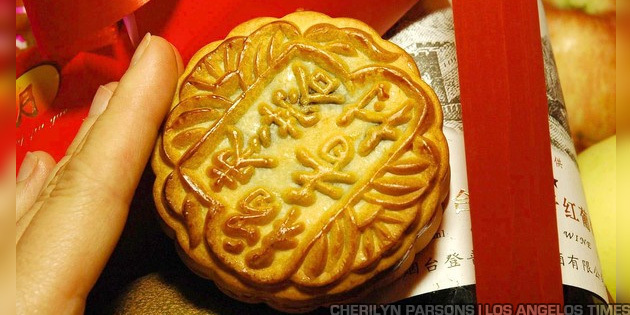 Read more about how "Mooncake becomes the Fruitcake of China"